There's nothing really that I've ever found in other lines that is like an etched line--its fidelity, the richness of it, the density. You just don't get that any other way. Image size: 8 x 6½"; paper size: 14 x 11½". Edition 25. A portfolio of six hard ground etchings with drypoint. Image size: 8½ x 11" or 11 x 8½" each; paper size: 13½ x 17" or 17 x 13½" each. Edition 20. Color hard ground and soft ground etching. Image size: 12 x 8"; paper size: 18 x 13". Edition 30. Hard ground and soft ground etching. Direct gravure printed in brown. Image size: 10 x 12¼"; paper size: 16 x 17¼". Edition 35. Sugar lift aquatint with drypoint printed in black. Image size: 15 x 15"; paper size: 21 x 20". Edition 35. Image size: 7 x 9½"; paper size: 13 x 14". Edition 35. Color spit bite aquatint with direct gravure and drypoint on gampi paper chine collé. Image size: 25 x 20"; paper size: 33 x 27". Edition 25. Spit bite aquatint with direct gravure and drypoint printed on gampi paper chine collé. Direct gravure on gampi paper chine collé. Direct gravure with aquatint and drypoint on gampi paper chine collé printed in brown. Image size: 20 x 25"; paper size: 28 x 32". Edition 20. Direct gravure with aquatint and drypoint on gampi paper chine collé. Image size: 5 x 6"; paper size: 10 x 10½". Edition 35. Image size: 4¾ x 6¾"; paper size: 9½ x 10¾". Edition 35. Image size: 4¾ x 6¼"; paper size: 9½ x 10¾". Edition 35. Image size: 12 x 9"; paper size: 16¾ x 13". Edition 25. Image size: 6½ x 8"; paper size: 11¼ x 12". Edition 15. Drypoint printed on gampi paper chine collé. Image size: 15¾ x 11¾"; paper size: 24 x 19". Edition 25. Image size: 22 x 18¼"; paper size: 30 x 25½". Edition 40. Image size: 18 x 24"; paper size: 26 x 31". Edition 40. Direct gravure printed on gampi paper chine collé. Image size: 22 x 18¼"; paper size: 30 x 25½". Edition 30. Image size: 18 x 24"; paper size: 26 x 31". Edition 30. Image size: 11¾ x 15¾"; paper size: 20 x 23". Edition 25. Color drypoint with hard ground etching printed on gampi paper chine collé. Image size: 29½ x 21¾"; paper size: 39¾ x 30½". Edition 40. Hard ground etching with drypoint printed in black and blue. Image size: 6 x 8"; paper size: 13 x 14". Edition 40. Color drypoint with direct gravure and spit bite aquatint. Image size: 12 x 22¼"; paper size: 21¼ x 30½". Edition 40. Drypoint with direct gravure and spit bite aquatint printed in black and blue. Image size: 12 x 22¼"; paper size: 21¼ x 30½". Edition 20. Color direct gravure with aquatint and drypoint. Image size: 17¼ x 23¼"; paper size: 26½ x 31¼. Edition 40. Color direct gravure with drypoint. Image size: 9 x 11¾"; paper size: 18¼ x 20". Edition 40. Hard ground etching with aquatint printed in black and pink. Image size: 6 x 6"; paper size: 13 x 12". Edition 40. Image size: 7 x 7"; paper size: 12½ x 12". Edition 35. Image size: 6¼ x 4¾"; paper size: 12 x 9¾". Edition 25. Image size: 10 x 16"; paper size: 15 x 20". Edition 40. Hard ground etching printed in burnt sienna. Image size: 11 x 9"; paper size: 21 x 17". Edition 35. Drypoint and spit bite aquatint printed on gampi paper chine collé. Image size: 15 x 15"; paper size: 22¾ x 22½". Edition 35. Image size: 17¾ x 23¾"; paper size: 28¾ x 33¾". Edition 50. Color hard ground etching printed in pink on gampi paper chine collé. Image size: 26 x 15¾"; paper size: 36¾ x 25¾". Edition 50. Color hard ground etching with drypoint, spit bite aquatint and aquatint. Image size: 29¼ x 20½"; paper size: 39½ x 29¾". Edition 50. Hard ground etching with drypoint, spit bite aquatint and aquatint printed in black and red. Image size: 29¼ x 20½"; paper size: 39½ x 29¾". Edition 10. Hard ground etching with drypoint, spit bite aquatint and aquatint. Image size: 29¼ x 20½"; paper size: 39½ x 29¾". Edition 20. Hard ground etching printed in red and black. Image size: 13 x 21¾"; paper size: 21¾ x 30". Edition 50. Color soap ground and spit bite aquatints with drypoint and aquatint. Image size: 15½ x 27"; paper size: 24 x 34". Edition 50. Spit bite aquatint with drypoint. Image size: 15½ x 27"; paper size: 24 x 34". Edition 10. Color hard ground etching with drypoint. Image size: 8½ x 11"; paper size: 15¾ x 17½". Edition 50. Image size: 15½ x 27"; paper size: 24 x 24". Edition 10. Image size: 9 x 10½"; paper size: 15¼ x 16". Edition 50. Aquatint with soft ground etching, drypoint and spit bite aquatint. Image size: 22 x 16"; paper size: 30 x 23". Edition 35. Color soft ground etching with spit bite aquatint, aquatint and drypoint. Image size: 22 x 16"; paper size: 30¾ x 24". Edition 50. Image size: 9 x 12"; paper size: 18 x 20". Edition 50. Image size: 5 x 7"; paper size: 12 x 12½". Edition 35. Image size: 30 x 22"; paper size: 38¾ x 30½". Edition 50. Image size: 30 x 22"; paper size: 38¾ x 30½". Edition 30. Image size: 9 x 11¾"; paper size: 17 x 18¾". Edition 50. Image size: 12 x 9"; paper size: 19½ x 16". Edition 60. Color soft ground etching with drypoint and aquatint. Image size: 22 x 32"; paper size: 30 1/2 x 40". Edition 60. Image size: 22 x 32"; paper size: 30½ x 40". Edition 25. Image size: 7 x 6"; paper size: 14 x 12". Edition 60. Image size: 7 x 6"; paper size: 14 x 12". Edition 15. Image size: 15¼ x 16½"; paper size: 23½ x 24¼". Edition 200. Image size: 30¼ x 20¼"; paper size: 37 x 24". Edition 200. Image size: 24 x 18"; paper size: 31¼ x 23¾". Edition 35. Image size: 9 x 12"; paper size: 15¾ x 18¾". Edition 25. Image size: 12 x 9"; paper size: 20¼ x 16". Edition 35. Hard ground etching with aquatint and drypoint. Image size: 14 x 10"; paper size: 23 x 18". Edition 50. Image size: 15 x 17½"; paper size: 20¼ x 22¼". Edition 200. Color aquatint with hard ground etching, drypoint and spit bite aquatint. Image size: 12 x 9"; paper size: 20 x 16". Edition 50. Image size: 12¼ x 9¾"; paper size: 19½ x 15¾". Edition 35. Drypoint from Recent Etchings I. Image size: 17¾ x 21¾"; paper size: 22¼ x 30". Edition 50. Published by Parasol Press and printed by Stephen Thomas at Crown Point Press. Hard ground etching from Delights, a book of seventeen etchings. Image size: 5 x 6¾"; paper size: 12¾ x 11". Edition 100. Drypoint from Delights, a book of seventeen etchings. Image size: 4 x 4"; paper size: 12¾ x 11". Edition 100. Image size: 5 x 5"; paper size: 12¾ x 11". Edition 100. Image size: 5¾ x 7"; paper size: 12¾ x 11". Edition 100. Etching from Delights, a book of seventeen etchings. Image size: 5 x 6"; paper size: 12¾ x 11". Edition 100. Image size: 4 x 5"; paper size: 12¾ x 11". Edition 100. Image size: 7 x 7¾"; paper size: 12¾ x 11". Edition 100. Etching and drypoint from Delights, a book of seventeen etchings. Aquatint from Delights, a book of seventeen etchings. Etching and aquatint from Delights, a book of seventeen etchings. Image size: 3 x 4"; paper size: 12¾ x 11". Edition 100. Thiebaud was born in 1920 in Mesa, Arizona, and resides in California, in Sacramento and San Francisco. As a child, he lived in Long Beach, California, and in Hurricane, Utah, where his family’s farm failed during the Depression. 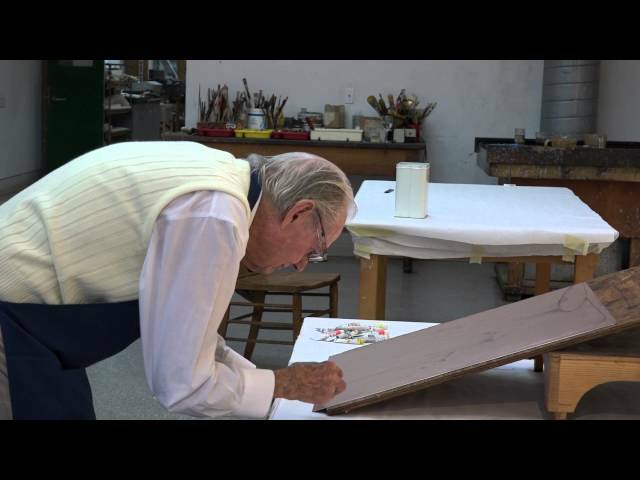 The family moved back to Long Beach in 1933, and Thiebaud worked in his youth as a sign painter and as an “in-betweener” in the animation department of Walt Disney studios. He studied commercial art in a trade school, attended Long Beach Junior College, and worked as a shipfitter in the Long Beach harbor. In the U.S. Army from 1942 to 1945, stationed in California, he drew a cartoon strip for the base newspaper. After leaving the service, he worked as a designer and cartoonist at the Rexall Drug Company in Los Angeles, where a fellow employee was painter Robert Mallary, who encouraged him to begin painting. Studying under the GI Bill, Thiebaud received a BA and an MA from California State College (now California State University) in Sacramento. His first one-person exhibition was in 1951 at the E. B. Crocker Art Gallery (now the Crocker Art Museum) in Sacramento. Thiebaud began teaching at Sacramento Junior College in 1951, and he has been a teacher ever since, working as a visiting professor in schools around the country from Colorado University to Harvard University and Yale University. At the same time he sustained a teaching commitment to the University of California at Davis begun in 1960. (He nominally retired in 1990.) He lived for a year in New York City in 1956–57, became friendly with Elaine and Willem de Kooning, and met other abstract expressionist artists. His first exhibition in New York, at the Allan Stone Gallery in 1962, received tremendous critical attention, with reviews in Newsweek, Art News, the New York Times, and Life magazine. That same year he had a one-person exhibition at the de Young Museum in San Francisco. Thiebaud began making etchings at Crown Point Press in 1964. His first prints date from 1950, and he has been an active printmaker throughout his career. 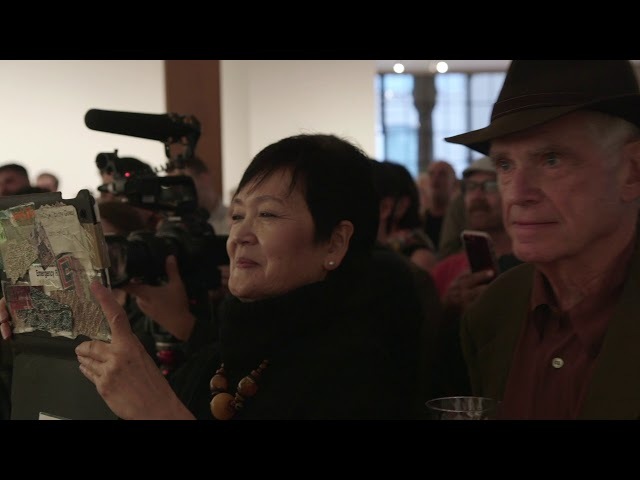 He has shown in numerous exhibitions and received many awards, including the Gold Medal for Painting from the American Academy of Arts and Letters, New York (2017), the UC Davis Chancellor’s Lifetime Achievement Award for Innovation (2016), the Lifetime Achievement Award for Art from the American Academy of Design, New York (2001), and the National Medal of Arts presented by President Clinton (1994). His paintings are in the collections of most major museums in the United States including the Museum of Modern Art in New York, the San Francisco Museum of Modern Art, and the Art Institute of Chicago. He is represented by Acquavella Galleries, New York, and the Paul Thiebaud Gallery, San Francisco. 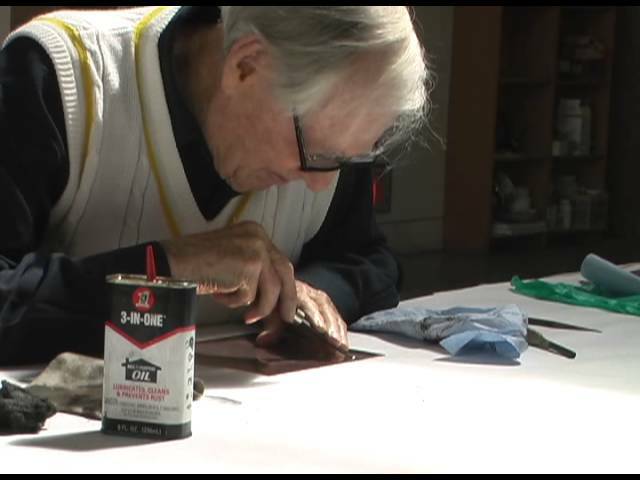 See Wayne Thiebaud working on etchings in the Crown Point studio in this video from 2017. Artist Wayne Thiebaud working at Crown Point Press in San Francisco, 2011. 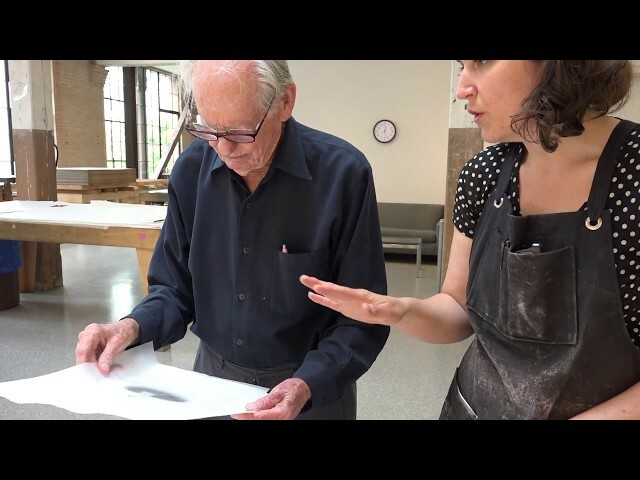 This video shows Wayne Thiebaud in the Crown Point Press etching studio.